We are accepting applications for a three bedroom unit. Click here to view information on available apartments. If you are interested in potential future opportunities at Hunter’s Point South Commons and Hunter’s Point South Crossing, residential application opportunities will also be posted on www.nychdc.com. When can selected lottery applicants expect to start hearing about consultations? Initial lease-up was completed on December 2015. As potential vacancies occur, we will contact applicants on the waiting list. What if my income fluctuates month to month or year to year? How will my income be assessed and what should I write on the application? People working in the arts and entertainment professions, along with other freelancers, small-business owners, and independent contractors, frequently have fluctuating income. To be prepared in the event you are selected for an consultation, it is critical to have documentation of all your income for the previous three years, the current year, and any documentation you have that future income circumstances will change (such as signed contracts for employment or services). Tax returns are invaluable as evidence of your past income, along with all your W-2s, 1099s, and documentation of cash income, such as bank statements showing deposits or letters from employers. If you are selected for a consultation, you will also need documentation of this year’s income: the six most recent paystubs for jobs you currently work, along with the last paystub for any job you worked that has ended this year. For a list of documentation required for non-employment income, see the “After You Apply: Resources” checklist at www.nyc.gov/housingconnect. Qualifying applicants for eligibility is a complex process and many factors are taken into account. If your income is episodic or fluctuating, make an informed projection of your annual income on the application, based on your past earning patterns and any guaranteed future income. If you are selected for a consultation, management will carefully examine all your sources of income to determine eligibility. The more prepared you are with organized documentation, the easier this process will be. Is net or gross income used to determine your income eligibility? Income will be calculated using gross annual income. (Gross income is the income you receive before any taxes or deductions are taken out.) For self-employed applicants, net income is analyzed, which includes net business income from current and prior years. Such applicants must have at least two complete years in the same self-employed field. If you reach the consultation stage, be prepared to submit a statement that details projected income and expenses through the end of the current calendar year. What documentation is needed for a disability preference? What about other disabilities besides those listed above? What about preferences for senior citizens or veterans? In most cases, the household member will be asked to authorize verification of the mobility, visual or hearing disability and designate a person to provide that confirmation, usually a medical provider. Other disabilities, even those of a medical nature, do not receive a preference under this program. The municipal employee preference applies only to current employees, not retirees. This program does not include preferences for senior citizens or veterans, but other programs in the future may consider including these classifications. How do my assets figure into eligibility? All applicants will need to declare all assets, including retirement assets and any property. Pending the program relevant for your household, those assets may be factored as part of your application. Credit screening and criminal background screening will be completed for all eligible applicants. Credit screening for applicants considers a variety of factors including amount of debt supported by the household; recency of bankruptcy, if any; outstanding judgments or liens; the extent of negative credit lines. Will DRIE and SCRIE be accepted? The Department of Finance handbook for these programs describes the circumstances of which you can transfer your DRIE or SCRIE to a new rental. You can research both programs online at www.nyc.gov. Why is there a gap between low-income eligibility and middle/moderate income eligibility? 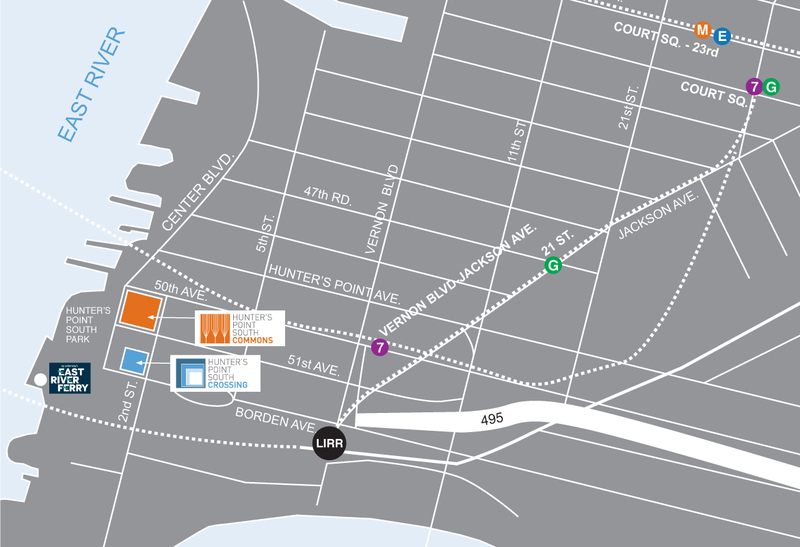 Hunter’s Point South Living is 100% permanently affordable. It offers beautiful apartments and amenities designed to the highest standards for all residents. We wish that each program could address all needs, but the income ranges established was what was planned for these two buildings. It’s important to remember that Hunter’s Point South Crossing and Commons are the first 925 apartments of what will eventually be 5,000 units on the LIC waterfront, so there will be other opportunities there in the coming years. What if I already live in affordable housing? What if it’s in one of Related’s other affordable housing programs? There are no restrictions as to how many or whose affordable housing program of which you apply. However, remember to apply only once to any program. What if my information changes? I just submitted my application and realize I made a mistake – what do I do? Your application will initially be reviewed based upon your submitted application. When Related contacts you about your application, you will have the opportunity to present complete and correct information. Do not submit an additional corrected application. Where will consultations take place? Consultations will take place at Hunter's Point South. What information will I need to present? Be prepared to present copies of recent years’ federal tax returns, recent paystubs, and copies of financial statements. Start to keep these now so you will have them easily available if you are invited for a consultation. For more information on documentation requirements, please see the “After You Apply: Resources” link on nyc.gov/housingconnect. What about applicants not offered an opportunity when Hunter’s Point South Living first leases? Will there be a waiting list? Applicant households that appear eligible but are not contacted during the lease-up period will be placed on the waiting list. As vacancies become available, these households will be contacted in order to confirm eligibility. Income eligibility requirements may change depending upon HUD income limit data released annually by the federal government. What if my family size or income changes while I am waiting to hear about the lottery? If your income or family size changes while you are waiting to hear about the lottery, keep any records of that change. If you receive an invitation for a consultation, management will re-calculate your income and assess your eligibility with the new information. Apartment selection will be available for the units of which your household qualifies at that given time. Participants in the low income program will need to recertify annually. Participants in the middle or moderate income program will only need to certify their incomes once prior to initial lease signing, regardless of how long they remain tenants of the buildings. Hunter’s Point South Commons and Hunter’s Point South Crossing are exclusively rentals. What are the preferences for these buildings? What if I qualify for more than one preference? Hunter’s Point South Living features four preferences which are reviewed in the following order: 5% of apartments for households with mobility impairment, 2% of apartments for households with visual or hearing impairment, 50% of apartments for residents of Queens Community Board 2, and 5% of apartments for current municipal workers. The preferences apply to both buildings, Hunter’s Point South Commons and Hunter’s Point South Crossing, as one. If your application qualifies for more than one preference, it will be processed when we reach your application number according to the priority list above. Qualifying for multiple preferences by itself does not provide you with a greater priority. The preference percentages are targets, not quotas and do not extend past the initial leasing period. If you are offered a lease at Hunter’s Point South Crossing or Commons, you will have your choice of a 1-year or 2-year lease term and you will receive a rent-stabilized lease. At the time of renewal, you will again have a choice of a 1-year or 2-year lease term and your adjusted rent will be the lesser of two figures: 1) the affordable housing program rent, calculated from income guidelines released annually by the Federal Department of Housing and Urban Development, and 2) the current rent adjusted by the current approved increase from the New York City Rent Guidelines Board. For residents in the middle or moderate income program, that increase may be a minimum of 2%. Heat and hot water will be included. What happens if my income changes after I move in? Your continued participation in and enjoyment of the affordable housing program benefits at Hunter’s Point South Crossing and Commons depends upon adherence to the requirements outlined in the lease, accompanying riders, and the affordable housing program rider. In general, these include paying your rent as required and abiding by house rules for use and enjoyment of your home and the premises. For those participating in the low income housing program, annual recertification is required, but changes to your household and financial circumstances from year to year do not impact your rent. For all residents rent adjusts solely as described above. Apartments are designed to be permanently affordable. What are the amenities? Is there a fee? All residents will enjoy the benefit of a 24-hour attended lobby, an on-site Resident Manager, and on-site staff to assist with them. Other amenities, which do have a cost, include use of a party room, an outdoor terrace, a fitness center, playroom, a bike room, resident storage, and The Farm, an outdoor community garden. The costs will cover maintenance and operations of the amenity facilities. Parking will be located at Hunter’s Point South Commons and available to residents of both buildings for a fee on a first come, first served basis. It is managed by Manhattan Parking Group; they can be reached at 718.433.1420. There are approximately 250 parking spaces available. We welcome pets. Our policy limits pets to weights under 75 pounds. Breed restrictions for dogs will apply. Pet owners will need to complete a special Pet Rider addendum to their lease. Will the lobby be attended? Yes, the lobby will be attended 24/7. Do the apartments have dishwashers? How about washer/dryer units? All apartments have dishwashers. All 2 and 3 bedroom apartments will feature washers and dryers. There are also laundry rooms in each building.